Kristi-Leigh Gresse performs her solo “Blank” at JOMBA! On The Edge. Photography by Val Adamson. Lighting by Julie Ballard (Chicago, USA). Eleven days ago, I dipped my toes into the Indian Ocean for the first time. Standing on the edge of a continent that’s not mine, I felt a long way from home. But as I sat in the Elizabeth Sneddon Theatre on Tuesday at JOMBA!’s On the Edge platform, the shores of Lake Michigan didn’t seem quite so far away. What I’m trying to say is, JOMBA! has provided me a window into the dance scene in Durban, and while there’s something unique and special happening here, sitting in plush seat, in a dark room, watching dancers dance feels pretty much the same as it does 9,000 miles away at my favorite haunts in Chicago. That’s not to say that dance is universal, exactly, or universally valued across cultures (a thought for another day). But movement has the ability to transcend place and language; choreography — literally “dance writing” — conveys stories, thoughts and emotions with which we all grapple. Themes of gender and sexuality are overwhelmingly present in JOMBA! 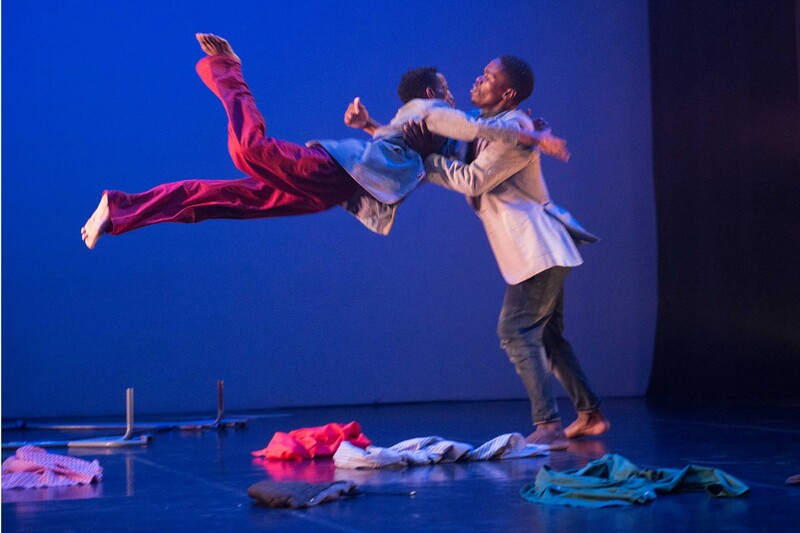 this year, and On the Edge is no exception, with commissioned works by emerging choreographers JC Zondi, Kristi-Leigh Gresse and Tshediso Kabulu with Thamsanqa “Thami” Majela each capturing the dissonance between a search for identity and personal safety weighed against society’s expectations. JC Zondi’s “Classi_filed” at JOMBA! On The Edge. Photography by Val Adamson. Lighting by Julie Ballard (Chicago, USA). Zondi’s “Classi_filed,” a group work which best honors the company’s two women, wrestles, sometimes literally, with how clothing is used to suppress or express one’s identity. The 35-minute work is beautifully composed, with an elipses at end — that is, Zondi could afford to add 10 more minutes without making us too antsy. He uses suit jackets and coat hangers to express a bound oppression to the expectations of man- and womanhood, juxtaposed at the end with disinterested runway walks, hangers dangling from each cast member’s final costume. 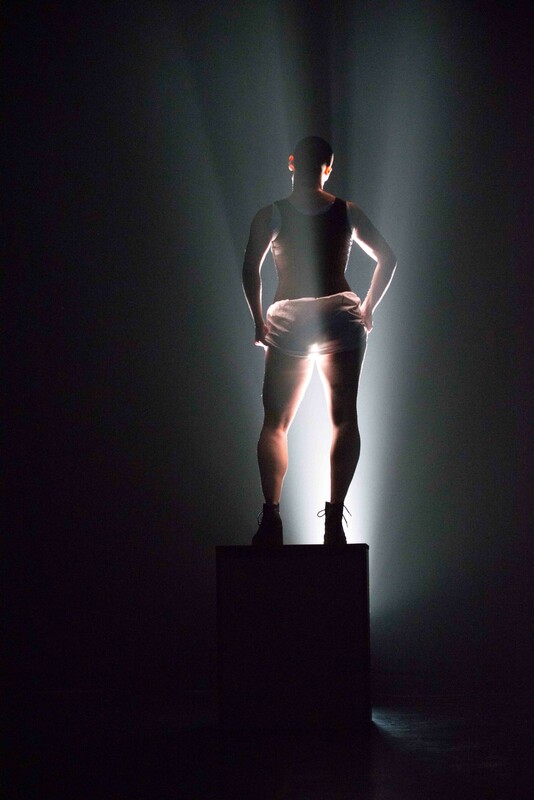 Performing solo, Gresse sets her work “Blank” atop a white podium, spinning like a jewelry box ballerina while accosted by invisible men peeking up her skirt. A translucent plastic sheet drops in front of the box, obscuring our view as she dons chunky boots and a corset, her angst and fear first dissolving into boredom and nonchalance; by the end, it’s all rage as she stomps her boots to Leslie Gore’s “You Don’t Own Me,” and assumes statuesque images of my favorite of ballet’s protagonists: Sylvia, the huntress, and Odile, the black swan. There’s something horrible about the repetitive sounds of a crosswalk signal in the sound score; the idea of waiting for permission to cross made me want her to leave that white pedestal and stomp off the stage — which is probably exactly why she doesn’t. Though Kabulu and Majela’s “Imvelo” has a mystical feel, invoking the ancestors with a forest-like mood and tiny LED-candles at each corner of the stage, their duet wanes between the spirit and human realms in its execution. With Kabulu as the oppressor, he could be implying tradition, a peer, or a self-defeating voice in Majela’s head. They battle this out for longer than they need to, but I guess that’s not so dissimilar to life. 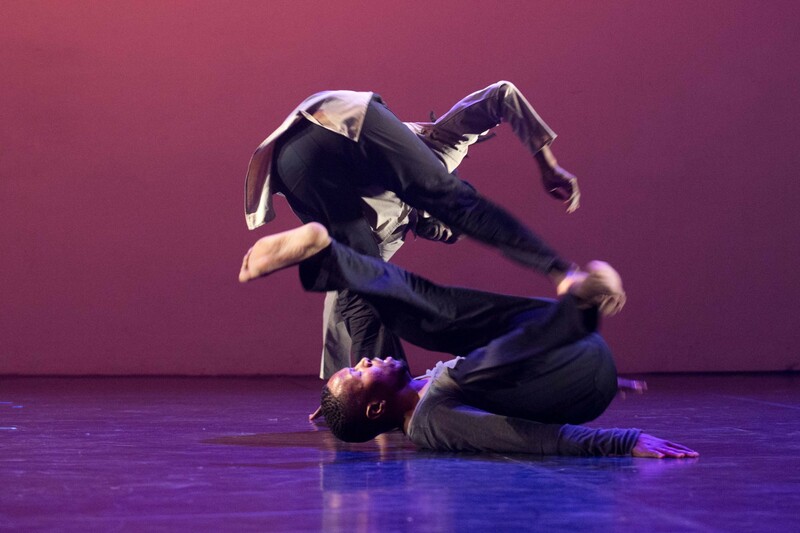 Tshediso Kabulu & Thami Majela in “Imvelo” at JOMBA! On The Edge. Photography by Val Adamson. Lighting by Julie Ballard (Chicago, USA).